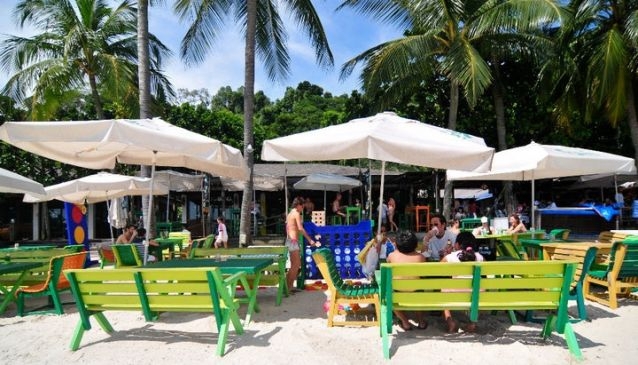 The legendary and colourful Bikini Bar along Sentosa's Siloso Beach boasts a wide range of ice-cold Bintang beers, cocktails, frozen cocktails, wine, champagne and house pour spirits. Buzzing with life on a sunny afternoon all the way till late night, Bikini Bar is the place to slow down and get into the beach mode. Watch live sports, laze the afternoon away or simply play some beach games like the giant Jenga game or just tikling the ball on the Pool table. On the Bar bites menu you can accompany your drink with a savouring selection of Tacos, BBQ Pork Ribs, Nachos, spicy wings or grilled chicken wing and a few pizzas.